I first went hands on with Killzone Mercenary at E3. I had two observations at that time: It looked great, and it controlled great. I had high hopes for the game, and really enjoyed the Multiplayer beta. 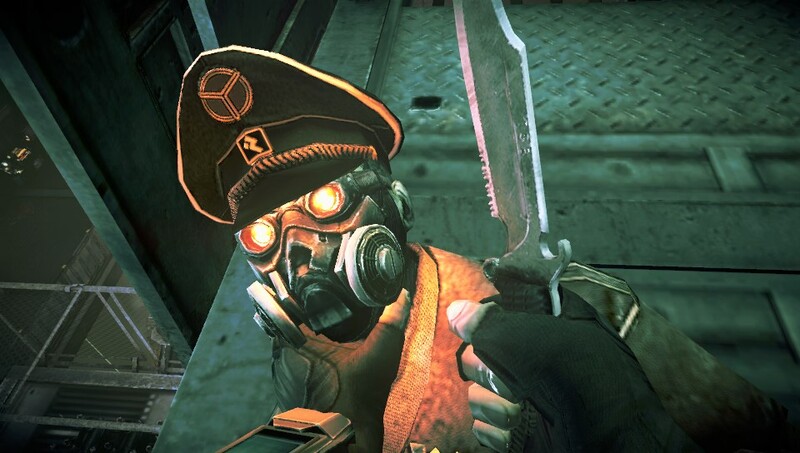 Now, Killzone Mercenary has released, and I can say, unequivocally, that it is the greatest handheld FPS ever made. In Killzone Mercenary, you play as Arian Danner, a mercenary working for the Phantom Talon Corporation. The ISA have taken heavy losses in their war on Vekta against the Helghast, and have resorted to hiring mercenaries to fight for them. You’ll fight alongside events from Killzone and Killzone 2, running missions for the ISA to help them succeed. Later, you’ll take the fight to Helghan itself. The story isn’t anything to scream about, with its requisite plot twists you might see coming, but I actually had fun with it. The characters are actually memorable, remarkable for a handheld FPS. It helps that the cast of characters is very small, so it’s easy to keep track of what’s going on. If you want to blast through the single player campaign, each mission is only about 30 minutes, tops, so with 9 missions total, you’ll have it licked in a long afternoon. Despite its length, the single player campaign is no joke. The Vita is capable of driving decent enemy AI. If you take cover, enemies might hang back from you until reinforcements arrive, at which point they’ll begin a pincer attack on your location. While they don’t need as much firepower to drop as in Killzone 1, in groups they can be a challenge. I often chose to covertly take a group out one by one with a silenced weapon or melee from behind. If I have one complaint about the single player campaign, it’s that each level is a series of enclosed encounters, requiring you to take everyone out or sneak past. These encounters take place in open areas, allowing for different tactics to be used, but there’s rarely any variety between the pattern of encounter to hallway to encounter to hallway. That being said, it looks amazing. Killzone Mercenary brings the Vita to life with dynamic lighting and weather effects that could be confused as originating from a PS3 title. In one mission, I looked down the sights of my gun in the rain. A droplet fell on the glass of my optics and beaded up in such a way that I had to pause the game and remark at how good it looked. This is the best-looking, technically advanced handheld game ever made, period. If the campaign is short, though, Guerrilla Games Cambridge has put an ingenious replay system into the game. One you complete a mission, you can go and replay it in one of three styles: Precision, Covert, and Demolition. Precision demands speed, headshots, and surgical accuracy. Covert is all about stealth and assassinations., and Demolition is about mayhem. Picking one of these additional mercenary contracts adds new mission requirements that are normally not present. For example, in the first mission, Precision had me locate and rescue 5 hostages. I didn’t even know there were that many on my first time through. Covert required me to use an alternate path to get to an objective, and Demolition forced me to attempt a Triple Kill on the Helghast, which can be tough since the length of time you have between kills to earn this bonus is quite small. I spent hours trying to complete all three, and this was only mission 1. Oh, and before I forget, each mission has 6 pieces of intel to find: 3 from interrogating officers, and 3 from intel terminals found in the level. Good luck finding them all. Intel terminals can easily be missed in the rush from point A to point B, and getting behind an officer can be maddening in later levels without a detailed plan of attacks. Alternate contracts require you to take specific weapon loadouts. You’ll have to buy your equipment from Blackjack, an arms dealer who minces no words about supplying both sides of the conflict to turn a profit. He’s got kiosks all over the place, and he’s ready to serve you. Each weapon you buy, using the money you earn from successful missions fits an archetype: Machine gun, SMG, Sniper Rifle; but each definitely feels unique enough to warrant investigation. If you play through all of the optional Contracts, you’ll get hands-on time with all of them. Secondary weapons aren’t limited to just pistols, but you can also equip shotguns and even rocket launchers. You can also choose from one of six different grenades, but the most interesting items you can equip are the Vangaurds. Vanguards are extremely powerful tools that last for a limited time. Everything from a satellite that highlights enemies, even behind walls, to a remote controlled drone that kills enemies with a brain stab, to a cloaking device, are all available. Once they deplete, you’ll either have to pay Blackjack a visit and pay for an instant recharge, or recharge over time by taking actions that earn you money. Money is earned through every in game action, Everything from a headshot, to taking out a security camera, to completing a section of a level without being detected, earns you cash. The constant popups make you feel like a total badass, especially if you get a particularly potent kill, and watch the money counter go up and up. Money also determines your rank. You’ll increase your rank and unlock more loadout slots as you do. Money can also be spent in the middle of a mission to buy ammo or swap between weapons you’ve purchased. While it looks great, you probably care a lot more about how it controls. 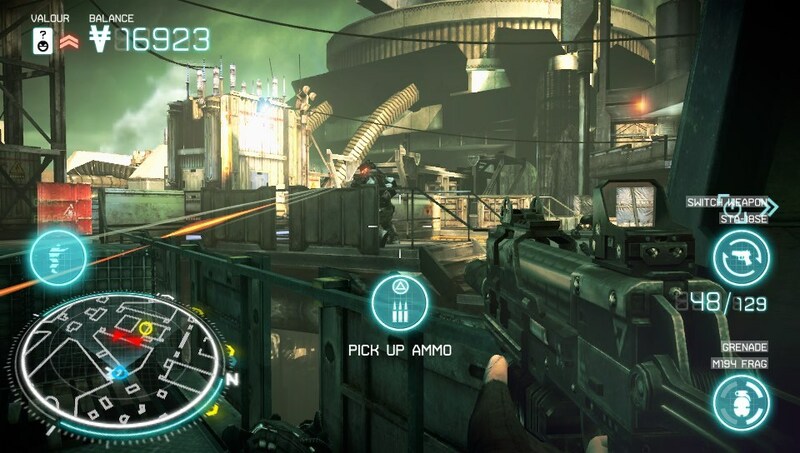 As a handheld game, Killzone Mercenary could be limtied by its lack of second shoulder buttons or clickable sticks. It could also suffer from an over-reliance on the touchscreen. Killzone Mercenary does the smart thing: everything. You can either press the grenade icon on the touchscreen, or press down on the d pad to throw a grenade. Press right on the d-pad, or press the weapon icon to swap weapons. Press left on the d-pad or press the vanguard icon to use your limited vanguard powers. Tap circle to run, or double-tap the d-pad. Almost everything has two methods of control. The only thing that requires touch is the melee attack, which is initiated after you press triangle near a foe: Swipe in the direction indicated to kill. You can also slide your finger up and down on the back touch while sniping to zoom in and out, which feels brilliant. You can use the gyroscope to adjust your aim minutely when zooming in, but this is optional, and off by default. The control scheme is not in your way; it gets out of your way. Simply put, you never fight the controls and it feels great. You can open a salvo of fire into oncoming enemies, tap circle to run, and then tap it again to slide into cover. 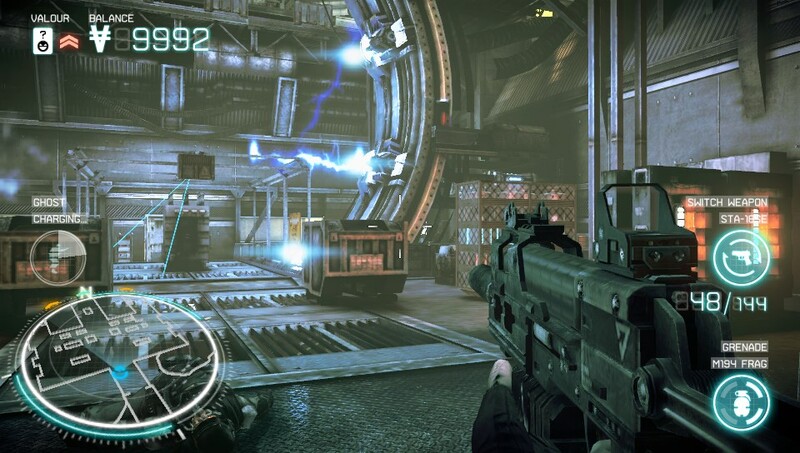 Cover in Killzone Mercenary works like other Killzone titles; press L to pop out and aim down the sights, and then release to pop back into cover. Killzone Mercenary doesn’t feel as heavy as Killzone 2, either. I couldn’t believe how easy it was to do everything I wanted to do. Multiplayer is limited to 8 players, and there are only 6 maps. Each feels wildly different, with some built for a sniping experience, and some built for close range urban combat, but are all built for an 8 player experience. There are 3 modes: Free-for-all, Team Deathmatch, and Warzone, in which you’ll play through four objective types in a single match. One fun feature of multiplayer is valor cards. Your leaderboard rank and preferred style of play are reflected in a playing card called a Valor Card. You get them by completing single player missions, but what’s more fun is taking them off the bodies of your fallen foes. You can collect sets of Valor Cards for big money bonuses, and there’s a certain amount of pride in picking up an ace. Also, all the weapons, equipment, and money you earn in single player carry over to multiplayer, and vice versa. It’s not hard to unlock the entire armory. There might be an argument that in smaller engagements, it could be hard to find the enemy to kill them, but Guerrilla Cambridge have added a neat feature that ensures you’ll always have a point of interest in the heat of battle. During a match, Vanguard capsules–item drops that will instantly give you a random Vanguard to use–will drop in random locations around the map. You can expect fights to creep up around these critical drops, since sitting back and turtling is not an option: Enough of these Vanguard capsules can turn the tide of any match. They ensure a constant battle, and are great for people new to the game; while they are learning the layouts of the maps, they can always count on heading toward the Vanguard capsules to get a piece of the action. The big problem in multiplayer is uneven teams. What’s the big deal with 31 v 32, something you might see in a larger game? However, 3 v 4 can be felt, and anything more imbalanced is rough. If people quit during a match, the impact is noticeable. If you own a Vita, you should buy Killzone Mercenary. It’s simply really, really polished. There’s a lot to do in single player alone, and the multiplayer, while small, is entertaining. I was never bored. Be warned it seems to be a bit of a battery hog, draining the battery after just 2.5 hours. This may actually be a bug, but for right now, keep that in mind. Even with this, I couldn’t stop talking about Killzone Mercenary with the rest of Gamer Horizon, and I think it deserves to stand shoulder to shoulder with other console shooters; mainly because it has no competition on handhelds. Ted did not receive a copy of Killzone Mercenary for review purposes. He completed Single Player on Veteran, the hardest difficulty, and played several of the earlier missions’ specialty Contracts. He currently holds King rank, the second highest, in multiplayer.